On February 6, 2008, I flipped on the TV as I was getting ready to come into the office. Good Morning America was running a story about a tornado that had touched down in some town somewhere in the U.S.
As crazy as it sounds, I glanced at the heavily damaged apartment in the background of the shot and thought, “I recognize that place.” A moment later, I realized why: it was one of the dorms at my alma mater. On the evening of February 5, Union University changed forever. 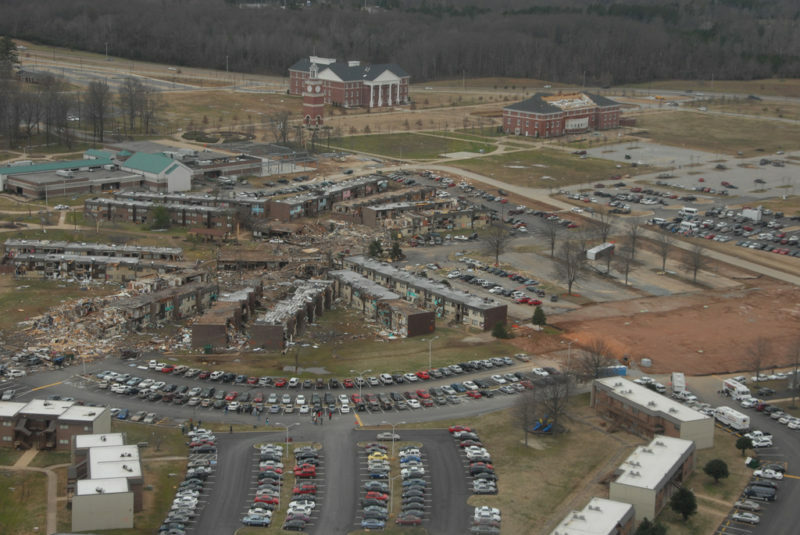 An F-4 tornado tore through the campus, destroying 70% of the student housing complex and heavily damaging several academic buildings. In all, the campus suffered $40 million in losses. Gone were the Men’s Commons and Women’s Commons, where Merriem and I spent a lot of our time and once got chided by Dave (the men’s housing director) because we were sitting too close. Gone was the Sugar Shack, aptly named because that’s where all the college sweethearts said goodnight. Gone was the dorm where I hid our engagement ring, where my buddies Dwayne and Mike and Adam and I talked about the girls we were going to marry (and all of us eventually did), where we played more practical jokes than you can count and watched Wayne’s World on VHS no less than 250 times. Watching the sun rise on the devastation was heartbreaking…but the heartbreak quickly gave way to amazement as it was reported that not one single student lost their life. Even more amazing was the crystal-clear testimony that each student shared to a worldwide audience via CNN, Fox News, ABC, CBS, NBC, BBC, and dozens of other major news outlets. They refused to give cotton-candy-Christian statements like “God was watching out for us.” No, they talked about God’s purpose in our suffering, the indwelling power of the Holy Spirit, and the redemptive purposes of Jesus even in the midst of chaos. Story after story emerged of injured students who walked back into crumbling apartments to help extract their friends, of hospitalized students who shared the gospel with the firefighters who rescued them and doctors who cared for them, of professors, faculty, and students who went for days without sleep in order to get the campus back to some semblance of normal. The surrounding community came forward in droves to donate homes, apartments, and even an entire motel to displaced students; local architects worked round-the-clock to develop a plan to rebuild, and within two weeks classes resumed and the Union family celebrated the goodness and providence of God. I’ve never been prouder to be an alumnus of Union, and never been surer of the caliber and character of students that followed my class. There’s no better account of the night of February 5 than the one written by my friend and fellow graduate Tim Ellsworth, aptly titled God in the Whirlwind. Tim complied the stories of survival, of suffering, of the near-death situations that dotted the campus that night. It is a gripping, fascinating retelling that will help you forever settle the question of God’s ability to preserve life. I know that 99.2% of you who read this blog never went to Union, but after reading this book I guarantee you’ll want to be an honorary Bulldog. Want to do more? You can still contribute to the Rebuilding Union Fund.